This article is about the album. For the title song, see I Look to You (song). It received favorable reviews from music critics, based on an aggregate score of 66/100 from Metacritic and debuted on the U.S. Billboard 200 at number one with sales of 305,000, beating her previous career best first-week sale of 205,137 units with Just Whitney... (2002), and it was her first album to reach number one in the US since 1992's The Bodyguard. Additionally it became her fourth chart-topping album, thus extending her as the female artist with the most cumulative weeks at the number one position. It has spawned two official singles: The title song, which became a top 20 U.S. R&B chart single, and the international single "Million Dollar Bill", which hit the top ten in several countries worldwide and also becoming a US top 20 R&B hit. Since its release, I Look to You has gone on to sell over 5 million copies worldwide, earning platinum certification in seven countries and gold certification in eight. A promotional single, "Nothin' But Love", taken from the album, was only released to UK radio stations to promote the accompanying Nothing but Love World Tour. I Look to You had first been conceived in 2007 with recording and production taking place in 2008, as said Houston during her Los Angeles album listening party in 2009. Rumor of Houston's return to music were first circulated at the start of 2007 and were then substantiated when record label boss and close mentor Clive Davis confirmed that he would personally be involved in the project whilst speaking on The Oprah Winfrey Show. In February 2009, Houston appeared on stage at Davis's "Pre-Grammy Gala" where she performed a four-song set comprising "I Will Always Love You", "I Believe in You and Me", "It's Not Right but It's Okay", and a rousing version of "I'm Every Woman". Onlookers included her mother Cissy Houston, musicians Paul McCartney, Jamie Foxx and Barry Manilow as well as actors Antonio Banderas and Sylvester Stallone. She told press in London that her latest album will reflect her emotional state and chronicle events in her personal life since her last musical release in 2002. She said "That makes it real. The changes that we go through, the transitions that we go through, the tests that we go through, being a mother, becoming a single mother. It all had its ups and its downs, but for the most part, I kept my faith and I kept my head up... I took my time. All the triumphs and the ups and downs and stuff, it's all incorporated on the album, and hopefully not only does it inspire me, but inspires a whole lot of other people." The second single from I Look to You. The disco song, which samples Loleatta Holloway's "We're Getting Stronger (The Longer We Stay Together)", became Houston's thirteenth Hot Dance Club Play topper. According to Davis, I Look to You was not aimed at simply following current music marketing trends, but instead, staying true to who Houston is and the impact she has made on the music industry. The album's opener "Million Dollar Bill" was written and co-produced by Alicia Keys, after the singer-songwriter personally asked Davis if she could make a contribution to the album. Production courtesy of Kaseem "Swizz Beatz" Dean surprised critics, as they felt it was more of an "old-school R&B" production and did not sound like most "Swizzy" productions, and is "not an attempt at being a hip-hop club banger." Shaheem Reed from MTV commented "Houston's voice [was displayed] over a club-friendly beat that blends a rough-riding thump with R&B". "Nothin' But Love", produced by contemporary R&B and hip-hop producer Nathaniel "Danja" Hills, was described by Rap-Up magazine as being "uptempo [and] danceable [with a] hand-clapping beat." It was also described as being made for urban radio. "Call You Tonight" is one of two songs written by Johntá Austin and was produced by Norwegian production team Stargate featuring "their trademark guitar riffs." The other Austin track on the album is a mid-tempo R&B track titled, "Worth It", produced by Eric Hudson. In the Summer 2009 edition of Rap-Up, R&B singer Akon spoke about working with Houston for the then-upcoming album. In the interview he revealed that he had worked with her on two songs for the album; one of which, "Like I Never Left", was previously leaked to the internet. It had initially been tipped as a single. Davis said Houston wanted an island song, so they reached out to Akon. The song was likened to Janet Jackson's "My Baby," which featured Kanye West. American singer R. Kelly also wrote two songs for the album. One of the songs "Salute" was described as being "militaristic [with a] marching beat" that also features Kelly on the backing vocals in the chorus. In the song Houston makes reference to LL Cool J with the lyric, "Don't call it a comeback, I've been here for years." Kelly's other contribution, "I Look to You" became the album's title song, and was released as the album's debut single. When speaking of the piano ballad Houston said, "It sums up all I wanted to say." The album also contains a cover of the 1970s Leon Russell song, "A Song for You". Houston's cover begins with a slow piano intro, which picks up in the middle. Following the popularity of the dance remix B-sides appearing on the UK CD release of "Million Dollar Bill", a number of remix EPs were released. "I Look to You – The Remixes" was released on November 6, 2009 in the U.S. and UK, featuring 12 dance remixes of the first single "I Look to You". Also released in the UK and U.S. on November 6, 2009 was "The Remixes", featuring remixes of "I Look to You", "I Didn't Know My Own Strength," and "Million Dollar Bill". This was followed by the final remix EP being released on November 10, 2009, called "I Didn't Know My Own Strength Remixes", which was only released in the U.S.
On July 14, 2009, Houston travelled to Knightsbridge in London, England for an official album listening party. The evening was hosted at the Mandarin Oriental Hotel by Sony Music chief creative executive Clive Davis. In total nine songs were premiered including "Million Dollar Bill", "Nothin' But Love", "I Didn't Know My Own Strength", "Like I Never Left" (featuring Akon), "For the Lovers", "I Look to You", "Worth It," and a cover of Leon Russell's "A Song for You". "Call You Tonight" (produced by Johntá Austin) was also played and cited as a likely lead single. Davis pointed out that, "We didn't try to fit Whitney into the market." On July 21, 2009, Houston hosted a listening party with Davis in New York City. Amongst those in attendance were Alicia Keys, Diane Sawyer, Martha Stewart and Vivica A. Fox. The album preview triggered a standing ovation, and the song Million Dollar Bill was among those that received critical acclaim. Finally on July 23, 2009 at the Beverly Hilton Hotel in Beverly Hills, California, the final star-studded listening party took place that was attended by musical and Hollywood elites. Some of the attendees included Halle Berry, Jane Fonda, Stevie Wonder, Magic Johnson, Jackie Collins, Barry Manilow, Beverly Johnson, Diane Warren, Penny Marshall, Brian McKnight, and David Foster amongst others. Again the album was played almost in its entirety, receiving a standing ovation. Houston's performance on Good Morning America's 'Fall Concerts' series on the American television broadcast network ABC aired on September 2, 2009. She performed songs from the album, including single "Million Dollar Bill" and title song "I Look to You", as well as previous hits "I'm Every Woman" and "My Love Is Your Love". It was also announced at the start of September that Houston would be interviewed by Oprah Winfrey for the new season of The Oprah Winfrey Show and perform "I Didn't Know My Own Strength" as personally requested by Winfrey. The Winfrey interview turned into two one-hour specials featuring the most in-depth and personal interviews of both Houston's and Winfrey's careers and were screened on September 14 and 15 featuring the promised live performance of "I Didn't Know My Own Strength". Winfrey called it the best interview she has ever done. On October 3, 2009, Houston appeared on German television show, Wetten Dass, and later she was on Le Grand Journal in France to perform "Million Dollar Bill". On October 18, Houston performed the same song live on The X Factor, marking her first UK performance in over a decade. She also performed the single live on The X Factor in Italy. On November 22, 2009, Houston performed "I Didn't Know My Own Strength" at the 2009 American Music Awards in Los Angeles, which gave her a standing ovation. It was announced via Houston's official website on October 12, 2009 that the singer would embark on her first world tour in 11 years in promotion of her latest album I Look to You. "This is my first full tour since the My Love Is Your Love tour and I am so excited to be performing for my fans around the world after all this time. I am putting together a great show and cannot wait to perform the songs from my new album I Look To You along with some of your favourites." The tour began on December 9, 2009 in Russia with further dates including Germany, Switzerland, Austria, Belgium, Italy and Australia. The album was preceded by the release of the title song, "I Look to You" which was written by R. Kelly and produced by Tricky Stewart, Harvey Mason Jr., and Emanuel Kiriakou. The song was serviced in the U.S. as the lead single and later as the second international single. It peaked in the top 20 of the U.S Hot R&B/Hip-Hop Songs chart, number 70 on the Billboard Hot 100 and the top 30 of the Gospel chart. Internationally the song had mixed success, peaking as high as number 16 in Switzerland and as low as 115 in the United Kingdom. The album's second U.S. single (first single internationally) was "Million Dollar Bill," written and produced by Alicia Keys and Swizz Beatz. It peaked at 100 on the Billboard Hot 100 and in the top 20 on the R&B/Hip-Hop chart. Additionally it topped the Hot Dance Club Songs chart. Internationally the single experienced some success, including in the United Kingdom where it debuted at number 12, but eventually peaked at number five. The ballad, "I Didn't Know My Own Strength", written by Diane Warren and produced by David Foster, peaked at number 17 on the U.S. Hot Dance Club Songs chart after a remix was released as a bonus track on the U.S. iTunes version of the album. Later, following Houston's performance on The Oprah Winfrey Show, it appeared at number 61 on the U.S. Hot R&B/Hip-Hop Songs chart. Internationally the song peaked at number 38 and number 44 in Ireland and the United Kingdom respectively following its performance by Danyl Johnson, one of the finalists on the sixth series of The X Factor. It also charted on the Japan Hot 100 at number 16. Another song, "Nothin' But Love" was sent to UK radio stations as a promotional single to coincide with the Nothing But Love World Tour. It reached the A-list on BBC Radio 2. Digital Spy gave the song a positive review and awarded it 5/5. and called it a "modern Whitney classic". Meanwhile, "Worth It" debuted on the Korean International Singles Chart at number 182 before eventually peaking at number 56 and number 61 on U.S. Hot R&B/Hip Hop Songs chart. Initial critical response to I Look to You was generally positive with aggregated reviews on Metacritic awarding the album, 66/100. Most reviews have praised the selection of songs and Houston's delivery. Houston's voice has changed, becoming deeper and huskier. People magazine gave it three out of four stars, saying "Come Grammy night, Houston will leave just as she came." Slant Magazine critic Sal Cinquemani also wrote I Look to You finds Whitney struggling to hit notes and deliver phrases that should come effortlessly to such a seasoned vocalist; her vocal cords are plagued by edema, her voice reedy and lacking the crystalline clarity it once possessed on classics like "I Will Always Love You" and "I Have Nothing". Although critical of Houston's voice, Cinquemani also noted how her vocal change benefited the album: "[Houston] sounds alive, and seemingly happy to be. [...] The New Voice lives more contently in the midtempo numbers that allow her to sink into the grooves. [...] For the most part, I Look to You manages to sound completely contemporary without the use of guest rappers, dumbed-down lyrics, or slang." Likewise, Leah Greenblatt of Entertainment Weekly, who gave the album a B- rating, felt that Houston's huskier vocals lent an emotional intensity to the album: "Houston's famous voice, which now sounds husky and glottal, brings a gravity that the album's often generically worded ballads lack." However, the critic criticized the album for its lack of insight on her struggles of the past years, writing "listeners may feel shut out of the fight. Whatever hardship she's endured, the battles within remain a mystery." Allmusic gave I Look to You three stars (out of five) commenting about Houston's problems in the past, her voice and her talent: "I Look to You attempts to wash this all away with something of a return to roots—a celebration of Houston's deep disco beginnings, tempered with a few skyscraping ballads designed to showcase her soaring voice. Houston's rocky decade isn't ignored, but it isn't explored, either: songs allude to Whitney's strength, her willpower as a survivor struggling through some unnamed struggle — enough for listeners to fill in the blanks, either with their own experience or their imaginings of Houston's life. [...] at the very least, Whitney can still sing, knowing when to wring emotion out of a phrase, knowing when not to push for the glory notes that she can no longer hit. [...] What she undoubtedly is, is a pro – she sells these subdued glitzy productions, she makes boring songs interesting, she remains a forceful, tangible presence." Nick Levine of Digital Spy gave the album 4 out of 5 stars and said, "Thanks to contributions from a clutch of au courant R&B producers, it does sound contemporary...her voice may not be as technically impressive as it was, but its new, more weathered tones have character, making an optimistic song like Million Dollar Bill really quite touching and a defiant one like 'For The Lovers' more dramatic. If a little too steady to be called a classic, I Look To You is certainly an accomplished, enjoyable return—don't call it a comeback—from an artist who sounds keen again, a lioness who's rediscovered her pride." I Look to You debuted at number one on the US Billboard 200 with sales of 305,000 copies and is to date Houston's best opening week sales as well as the second best opening sales by a female artist for 2009. The album is Houston's fourth number one album overall, and the first since The Bodyguard (1992). The album also debuted at number one on the U.S. R&B/Hip-Hop Albums chart. Week three sales spiked to 156,000 following Houston's appearance on The Oprah Winfrey Show. On December 1, 2009, the album was certified platinum by the RIAA for shipping one million copies. In several countries, the album attained gold status within a month of its release. In Canada, the album shot to the top of the charts, selling 30,000 copies in its first week according to Nielsen SoundScan data, Houston's best opening totals since Nielsen SoundScan began tracking sales in 1991. Her last album, Just Whitney, debuted at number 85 with just 13,000 in sales. After three weeks the album had sold around 26,000 copies in Canada. According to Arista Records, the album also debuted at number one in the Netherlands, Poland, Germany, Italy and Switzerland. In the UK, the album debuted at three with first week sales of 51,632. The album also debuted at three in France with first week sales of 19,000. In Korea the album reached number one on the monthly chart and sold 12,429 copies. According to Houston's official website, the album and singles combined have sold a total of 500,000 copies in the UK and Ireland. The album also finished the 29th biggest selling album of 2009 in the United States. "Million Dollar Bill" contains a sample from "We're Getting Stronger", written by Allan Felder, Norman Harris and Ronald Tyson, as performed by Loleatta Holloway. "A Song for You" is a cover of the original song by Leon Russell. 1 2 3 4 5 6 7 8 9 10 "Preview: Whitney Houston – 'I Look to You'". Rap-Up Magazine. Rap Up. Retrieved August 22, 2009. ↑ "Whitney Houston we don't have a problem". E! Online UK. E! Entertainment Television. February 8, 2009. Retrieved June 10, 2010. ↑ Parks, Tim (July 27, 2009). "Houston: 'New album about my ups, downs'". Digital Spy. Digital Spy Ltd. Retrieved August 27, 2009. 1 2 3 4 "Whitney Houston Premieres New Album in London". Billboard Magazine. July 14, 2009. ↑ Reed, Shaheem (July 21, 2009). "Whitney Houston Debuts I Look To You at NYC Listening Party". MTV US. MTV Networks. Retrieved August 21, 2009. ↑ "Akon on Whitney Houston: 'She's Straight 'Hood'". Rap-Up. June 25, 2009. ↑ "I Look To You Remixes: Whitney Houston: MP3 Downloads". Amazon.com. Retrieved January 12, 2010. ↑ "I Look To You Remixes: Whitney Houston: Amazon.co.uk: MP3 Downloads". Amazon.co.uk. Retrieved January 12, 2010. 1 2 "The Remixes: Whitney Houston: Amazon.co.uk: MP3 Downloads". Amazon.co.uk. Retrieved January 12, 2010. ↑ Latest activity 2 days ago. "The Remixes: Whitney Houston: MP3 Downloads". Amazon.com. Retrieved January 12, 2010. ↑ "I Didn't Know My Own Strength Remixes: Whitney Houston: MP3 Downloads". Amazon.com. Retrieved January 12, 2010. 1 2 Bartolomeo, Joey (July 22, 2009). "Whitney Houston Previews New Album". People. Time Inc. Retrieved June 10, 2010. ↑ "Whitney Houston Lifts Off in New York". Rap-Up Magazine. Rap Up. July 21, 2009. Retrieved August 22, 2009. ↑ Melago, Carrie; Wills, Kerry (September 1, 2009). "Whitney Houston loses voice, cracks through Central Park 'GMA' concert – then blames Oprah". NYdailynews.com. New York Daily News. Retrieved June 10, 2010. ↑ "Whitney Houston Opens Up". Oprah.com. Retrieved September 22, 2009. ↑ "Whitney Houston Asks 'Wetten Dass?'". OK! Magazine. Buzz Media. October 5, 2009. Retrieved June 10, 2010. ↑ "Whitney Houston MDB live in French TV Le Grand Journal". Showhype.com. Future US Inc. October 6, 2010. Retrieved October 6, 2010. ↑ Levin, Nick (October 8, 2009). "The X Factor – News – Whitney confirms 'X Factor' performance". Digital Spy. Hachette Filipacchi Médias. Retrieved January 12, 2010. ↑ "Whitney Houston silences her doubters with spot-on Italian 'X Factor' performance". Hello magazine. Hello!. October 22, 2009. Retrieved June 10, 2010. ↑ Martens, Todd (November 22, 2009). "2009 American Music Awards: Grading the performances". Los Angeles Times magazine. Retrieved 2010-06-10. ↑ Česká republika. "European Tour Dates | The Official Whitney Houston Site". Whitneyhouston.com. Retrieved January 12, 2010. ↑ Česká republika. "Events | The Official Whitney Houston Site". Whitneyhouston.com. Retrieved January 12, 2010. ↑ "Deutschlandtour". Whitneyhouston.com. Sony Music Entertainment. October 12, 2009. Retrieved November 13, 2009. 1 2 "Whitney Houston Tickets Whitney Houston Tour Whitney Tickets Konzerte Tourdaten Whitney Houston Comeback von ticketbande". Ticketbande.eu. Retrieved January 12, 2010. ↑ "Union Street " Artist " Whitney Houston". Union-street.de. Retrieved January 12, 2010. ↑ "Antwerps Sportpaleis > kalender". Sportpaleis.be. Retrieved January 12, 2010. ↑ "Events – Tour dates". Whitneyhouston.com. Sony Music Entertainment. 2010. Retrieved May 3, 2010. ↑ "Chart Log UK: New Entries Update 31 October 2009 (week 43)". Zobbel.de. The Official Charts Company. October 31, 2009. Retrieved June 21, 2010. ↑ "Music – News – Chipmunk beats The Saturdays to No.1". Digital Spy. Digital Spy Ltd. October 11, 2009. Retrieved January 12, 2010. ↑ "UK Singles Chart Archive w/e 31 October 2009". The Official Charts Company. October 31, 2009. Retrieved June 21, 2010. ↑ "Whitney Houston – Allmusic > Charts & Awards". AllMusic. 2010. Retrieved June 22, 2010. ↑ "Irish Singles Chart week 43 (2009)". GfK Chart Track. GfK. October 22, 2009. Retrieved June 21, 2010. ↑ "Whitney Houston – I Look To You – Music Charts". Acharts.us. Retrieved January 12, 2010. ↑ "Revealed! This week's songs". itv.com. October 17, 2009. Retrieved October 17, 2009. ↑ "Whitney Houston.com news "Listen Out For Whitney..."". Whitneyhouston.com. J records. 2010. Retrieved April 1, 2010. ↑ "Whitney Houston Nothin' But Love review". Digital Spy. Digital Spy Ltd. March 29, 2010. Retrieved April 1, 2010. ↑ "AllMusic singles for Whitney Houston". AllMusic. 2010. Retrieved April 6, 2010. 1 2 Erlewine, Stephen Thomas. Review: I Look to You. Allmusic. Retrieved on September 4, 2009. ↑ Mitchell, Gail. Review: I Look to You. Billboard. Retrieved on September 5, 2009. 1 2 Greenblatt, Leah. Review: I Look to You. Entertainment Weekly. Retrieved on September 4, 2009. ↑ Petridis, Alexis (October 15, 2009). "Whitney Houston: I Look to You | CD review | Music". London: The Guardian. Retrieved January 12, 2010. ↑ Powers, Ann. Review: I Look to You. Los Angeles Times. Retrieved on September 4, 2009. ↑ Pareles, Jon. Review: I Look to You. New York Times. Retrieved on September 4, 2009. ↑ Rosen, Jody. . Now Magazine. Retrieved on February 19, 2010. 1 2 3 Cinquemani, Sal. Review: I Look to You. Slant Magazine. Retrieved on September 4, 2009. ↑ Jody Rosen (August 31, 2009). "Rolling Stone magazine Review: I Look to You". Rolling Stone. Retrieved September 25, 2010. ↑ Jones, Steve. Review: I Look to You. USA Today. Retrieved on September 4, 2009. ↑ "'I Look to You' by Whitney Houston". Metacritic. CBS Interactive. August 31, 2009. Retrieved June 21, 2010. 1 2 "Music – Album Review – Whitney Houston: 'I Look To You'". Digital Spy. Hachette Filipacchi Médias. September 2009. Retrieved October 31, 2009. ↑ Columnist. Review: I Look to You. Vibe. Retrieved on September 4, 2009. ↑ Whitney Houston Is Back at No. 1 NYTimes. Retrieved on September 8, 2009. ↑ Whitney Houston Debuts at No1 on Billboard Billboard. Retrieved on September 8, 2009. 1 2 "Whitney Houston's comeback tops U.S. pop chart | Entertainment | People". Reuters. February 9, 2009. Retrieved September 11, 2009. ↑ Jay Z still reigns Billboard. Retrieved on September 22, 2009. ↑ John Williams (September 9, 2009). "CANOE – JAM! Music – Artists – Houston, Whitney: Whitney Houston debuts at No. 1". Jam.canoe.ca. Retrieved January 12, 2010. ↑ John Williams. "CANOE – JAM! Music – Artists – Jay-Z: Jay-Z's 'Blueprint 3' hits No. 1". Jam.canoe.ca. Retrieved January 12, 2010. ↑ John Williams (September 23, 2009). "CANOE – JAM! Music – Artists – Muse: U.K. rockers Muse hit No. 1". Jam.canoe.ca. Retrieved January 12, 2010. 1 2 "Music – News – Burke beats Bublé, Houston to albums No.1". Digital Spy. October 25, 2009. Retrieved January 12, 2010. ↑ "Ecoutez des extraits de l'album de Mariah Carey". Chartsinfrance.net. September 14, 2009. Retrieved January 12, 2010. ↑ · 집계기간 : 2010.04.01 ~ 2010.04.30. "㈜한터정보시스템 ▒". Hanteo.com. Retrieved May 2, 2010. ↑ Whitney Celebrated her UK Success Whitney Houston.com (official website). retrieved: April 30, 2010. ↑ Billboard 200 Year-End 2009 positions 21–40 Billboard. Nielson SoundScan. Retrieved March 14, 2010. ↑ "Houston: Exclusive Remix with iTunes Pre-orders". Whitneyhouston.com. July 16, 2009. ↑ "Whitney Houston I Look To You Japan CD Album". eil.com. November 6, 2009. ↑ "I Look to You (CD, US Import)". HMV Jp. Retrieved July 15, 2011. ↑ "Product Page: I Look to You". Muze. Retrieved July 15, 2011. ↑ "Argentinian Albums Chart month of September 2009". Capif. Retrieved March 11, 2010. ↑ "Australian Record Industry Association". Australian-charts.com. Retrieved May 25, 2010. ↑ "Austrian Albums Chart (I Look To You)". austriancharts.at. Retrieved March 11, 2010. ↑ "Belgian Flanders Albums Chart". ultratop.be. Retrieved September 10, 2009. ↑ "Belgian Wallonia Albums Chart". ultratop.be. Retrieved September 10, 2009. ↑ "Canadian Albums Chart". jam.canoe.ca. Archived from the original on March 31, 2011. Retrieved September 10, 2009. ↑ "Croatian Albums Chart". HDU. Retrieved March 11, 2010. ↑ "Czech Albums Chart (I Look To You)". IFPI. Retrieved March 11, 2010. ↑ "Danish Albums Chart". danishcharts.com. Retrieved September 19, 2010. ↑ "Dutch Albums Chart". dutchcharts.nl. Retrieved September 11, 2009. ↑ "Finnish Albums Chart (I Look To You)". IFPI. Retrieved March 11, 2010. ↑ "French Albums Chart". chartsinfrance.net. Retrieved September 10, 2009. ↑ "German Albums Chart". mix1.de. Retrieved September 11, 2009. ↑ "GFK Chart-Track". Chart-track.co.uk. January 7, 2010. Retrieved January 12, 2010. ↑ "Italian Albums Chart". fimi.it. Archived from the original on May 11, 2010. Retrieved September 10, 2009. ↑ ホイットニー・ヒューストン-リリース-ORICON STYLE-ミュージック "Highest position and charting weeks of I Look to You by Whitney Houston" Check |url= value (help). oricon.co.jp. Oricon Style. Retrieved June 21, 2010. ↑ Steffen Hung. "Whitney Houston – I Look To You". lescharts.com. Retrieved January 12, 2010. ↑ "Norwegian Albums Chart (acharts)". acharts.com. Retrieved September 10, 2009. ↑ "Norwegian Albums Chart (lista)". lista.vg.no. Retrieved September 10, 2009. ↑ "Polish Album Chart". Retrieved September 14, 2009. ↑ "Portuguese Albums Chart (I Look To You)". Hung Medien. Retrieved March 11, 2010. ↑ Spanish Albums Chart for "I Look To You" Retrieved: June 10, 2010. ↑ "Swedish Albums Chart". swedishcharts.com. Retrieved September 6, 2009. 1 2 "Swiss Albums Chart (I Look To You)". Hung Medien. Retrieved March 11, 2010. ↑ "Taiwan G-Music International Chart Top 20 (Week 37, 2009)". Retrieved December 22, 2010. ↑ "Taiwan Five Music Western Chart Top 20 (Week 38 & 39, 2009)". Retrieved December 22, 2010. ↑ "Radio 1 – BBC Radio 1's Chart Show with Reggie Yates – UK Top 40 RnB Albums". BBC. February 24, 2007. Retrieved January 12, 2010. ↑ "Billboard 200". billboard.com. Retrieved September 10, 2009. ↑ "Billboard R&B/Hip-Hop Albums". billboard.com. Retrieved September 10, 2009. ↑ "2012 Top 40 R&B Albums Archive 3rd March 2012". officialcharts.com. The Official Charts Company. Retrieved 25 January 2015. ↑ "2014 Top 40 R&B Albums Archive 11th October 2014". officialcharts.com. The Official Charts. Retrieved 25 January 2015. ↑ "ARIA Charts – End of Year Charts – Top 50 Urban Albums 2009". Australian Recording Industry Association. Retrieved May 29, 2011. ↑ "Austriancharts.at – Jahreshitparade 2009". Hung Medien. Retrieved May 30, 2010. ↑ "Ultratop.be – Jaaroverzichten 2009". Hung Medien. Retrieved May 29, 2011. ↑ "Dutchcharts.nl – Jaaroverzichten 2009". Hung Medien. Retrieved June 4, 2011. ↑ "2009 Year End Charts – European Top 100 Albums". Billboard. Nielsen Business Media, Inc. Retrieved July 15, 2011. ↑ "VIVA Album Jahrescharts 2009" (in German). Retrieved June 24, 2011. ↑ "Annual Top 100 Albums – 2009". Polish Society of The Phonographic Industry. Retrieved April 10, 2011. ↑ "Sverigetopplistan – Årslista Album – År 2009 (Note: Go to Sök alla listor > Årslistor > Välj år 2009 > Visa!)". Swedish Recording Industry Association. Retrieved June 14, 2011. ↑ "Swiss Year-End Charts 2009". Media Control. Hung Medien. Retrieved February 6, 2009. ↑ "U.K Year-End Charts 2009" (PDF). Retrieved February 6, 2009. ↑ "2009 Year End Charts – Top Billboard 200". Billboard. Nielsen Business Media, Inc. Retrieved July 15, 2011. ↑ "2009 Year End Charts – Hot R&B/Hip-Hop Albums". Billboard. Nielsen Business Media, Inc. Retrieved July 15, 2011. ↑ "2010 Year End Charts – Hot R&B/Hip-Hop Albums". Billboard. Nielsen Business Media, Inc. Retrieved July 15, 2011. ↑ "Canadian album certifications – Whitney Houston – I Look to You". Music Canada. ↑ "French album certifications – Whitney Houston – I Look to You" (in French). Syndicat National de l'Édition Phonographique. ↑ "IFPI Middle East Awards – 2009". IFPI Middle East. ↑ "Gold-/Platin-Datenbank (Whitney Houston; 'I Look to You')" (in German). Bundesverband Musikindustrie. ↑ "Adatbázis – Arany- és platinalemezek – 2009" (in Hungarian). MAHASZ. ↑ "Irish album certifications – Whitney Houston – I Look to You". Irish Recorded Music Association. ↑ "Polish album certifications – Whitney Houston – I Look to You" (in Polish). Polish Society of the Phonographic Industry. ↑ "Russian album certifications – Whitney Houston – I Look to You" (in Russian). National Federation of Phonogram Producers (NFPF). ↑ "Guld- och Platinacertifikat − År 2009" (PDF) (in Swedish). IFPI Sweden. ↑ "The Official Swiss Charts and Music Community: Awards (Whitney Houston; 'I Look to You')". IFPI Switzerland. Hung Medien. ↑ "Whitney Concerts in Manchester and Glasgow to be Rescheduled | The Official Whitney Houston Site". Whitneyhouston.com. April 8, 2010. Retrieved May 2, 2010. ↑ "Whitney Houston präsentierte ihr neues Album in London!". UnionStreet. July 16, 2009. ↑ "Whitney Houston torna Esce il 28 agosto il suo nuovo disco 'I Look To You'". MTV.it. August 10, 2009. ↑ Leveringstid: 2-5 arbejdsdage. "I Look To You - Houston Whitney - Musik - CDON.COM". Cdon.dk. Retrieved September 4, 2009. ↑ Toimitusaika: 2-5 arkipäivää. "I Look To You - Houston Whitney - Musiikki - CDON.COM". Cdon.fi. Retrieved September 4, 2009. ↑ Leveranstid: 1-3 arbetsdagar. "I Look To You - Houston Whitney - Musik - CDON.COM". Cdon.se. Retrieved September 4, 2009. 1 2 "Album gets bumped up and first single promotion". official website. July 28, 2009. ↑ "I Look to You by Whitney Houston". HMV.ca. Retrieved September 3, 2009. ↑ "Whitney Houston / I Look To You – Hmv Hong Kong". Hmv.com.hk. Retrieved September 4, 2009. ↑ "I look to you : Whitney Houston en CD album : tous les disques à la Fnac". Musique.fnac.com. June 17, 2009. Retrieved September 4, 2009. ↑ "I LOOK TO YOU". musical.gr. Retrieved October 25, 2009. ↑ "I Look To You, Whitney Houston | Muziek". bol.com. Retrieved September 4, 2009. ↑ "Whitney Houston – I Look to You: 휘트니 휴스턴 새 앨범!". yes24.com. Retrieved August 30, 2009. ↑ "Sanitity: I Look to You Whitney Album". Sanity.com.au. Retrieved September 4, 2009. ↑ "Whitney Houston: I Look to You 惠妮休斯頓：我期待". sonymusic.com.tw. Retrieved September 19, 2009. 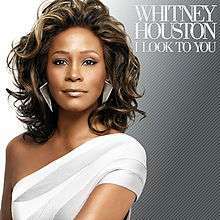 ↑ "I Look To You【CD】-Whitney Houston". Hmv.co.jp. Retrieved September 1, 2009. ↑ "I Look To You -Whitney Houston Brazilian release date". livrariacultura.com.br. Retrieved September 18, 2009. ↑ "Play: Whitney's UK release". play.com. August 13, 2009. ↑ "Whitney Houston I Look To You The Remixes Digital Album (MP3 Download)". SonyMusicDigital.com. December 24, 2009. ↑ "Whitney Houston I Look To You The Remixes Digital Album". Amazon.co.uk. December 24, 2009.